Though they’re two of my favorite foods, I was skeptical about burgers and cupcakes. I love burgers and cupcakes, but is it possible for one establishment to do both justice? Methinks not. And I was right, sorta. Don’t get your hopes up. The burger that was served to me looked nothing like the picture of a cheeseburger on their website. Instead of an artisanal roll, as depicted, the burger came with a standard squishy white bun, which was fine…but false advertising. Also, the fries are presented in a large basket, as was the burger, instead of a trendy tin. I’m not sure who they’re paying for stock imagery. Anyway. I ordered my burger with cheddar and avocado, one of my favorite toppings. The avocado was fresh and just ripe enough. 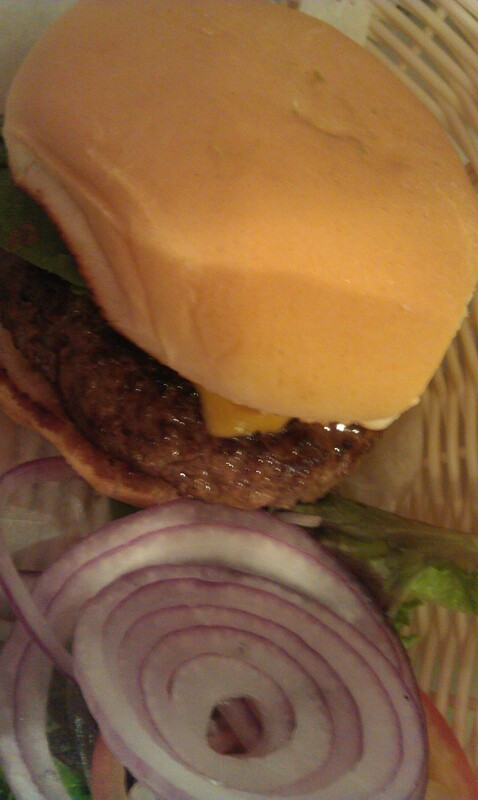 Though the burger was on the greasy side, I still enjoyed it. The fries weren’t exceptional, but many in number and tasted fine. My dining partner ordered onion rings, which were slight, crisp strings and delicious (much better than the fries). 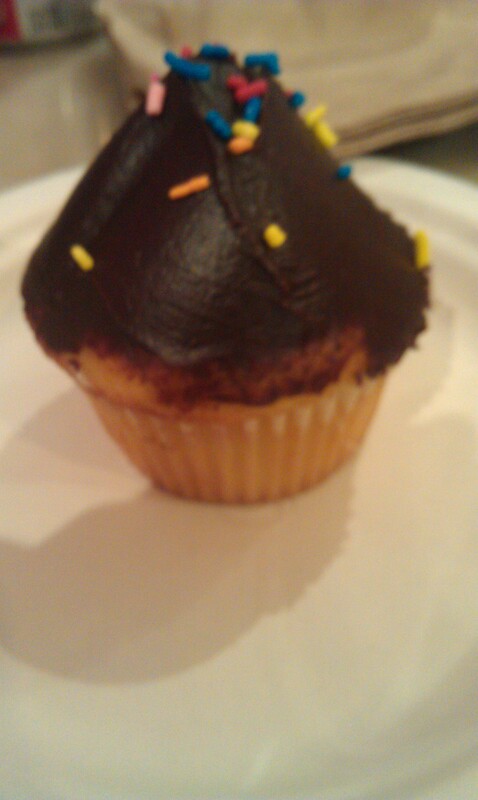 We both ordered cupcakes: vanilla cake with chocolate icing and chocolate cake with chocolate icing. The cake was dense and the icing not too sweet. You could explicitly taste the unsweetened chocolate they used to flavor the frosting. All said, the cupcakes, small and amply iced, are nothing to write home about. burger and cupcakes’ decor is odd. As New York wrote, it’s straight outta Dunkin’ Donuts land with its pink and orange hues. Cramped chairs and tables litter the floor. There doesn’t appear to be any waitstaff, so you might be inclined to order at the front and wait for your food at your tiny table. But you’d be wrong. There is one waiter who tends to 15+ tables in the joint. Odd. Mitchel London is a well-known catering company. You’d think they could afford to hire another waiter. Overall, the food was fine, but not worth going out of the way for. We happened to be in the neighborhood en route the 34th Street AMC theater, so it was local enough. Take the A/C/E to 34th Street and walk over to 9th.